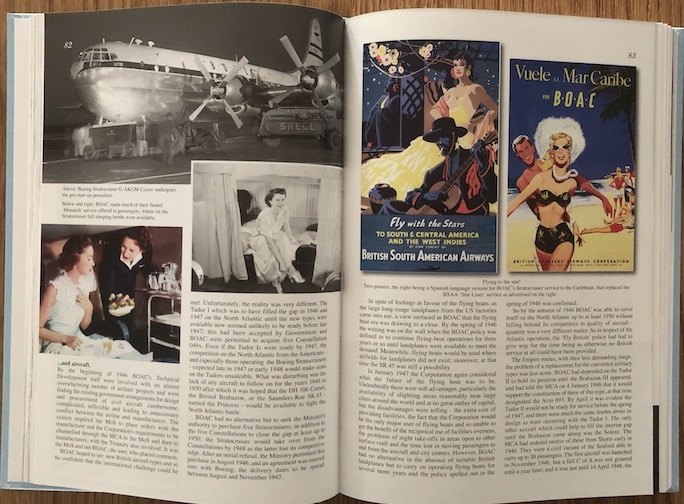 If you recently saw airliners in BOAC livery—the airline ceased operations under that name in 1974—you may have been wondering if you’ve been time traveling! Well, that’s the Heritage Scheme the current iteration of the successor company, British Airways, will fly for a few months in preparation for the upcoming 100th anniversary of BA. Presumably that’s why this book is coming out at this time; it doesn’t say that anywhere, nor, for that matter, does it mention August 25, 1919 as the date of the first regularly scheduled international flight or that it was that airline (AT&T, Aircraft Transport and Travel Limited) that would become, many mergers and takeovers later, BEA and then BA. 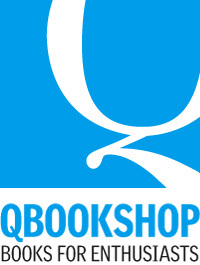 There’s a reason to throw around all these acronyms: the book is chock-full of them. Not by choice, mind you. As printed, the book is only half of what the author wished to say on the subject (“squeezing a quart into a pint pot”). That means space had to be conserved, hence the mass/mess of acronyms. It also means that the type size had to be made small to yield a precious few extra pages, and, inevitably, the illustrations are on the small side. Understandable all, but 8 pt type really is hard on the ole eyeballs. And let’s not even dwell on the rather too may typos, surely caused by the drastic paring-down of text and resulting rewrites that then probably didn’t get a final edit. Simons says the book was hard to write—well, it’s hard to read too, and not just because the type is small. 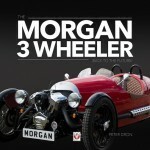 The book has a lot to say, possibly too much, but it most definitely is thorough. Simons is of course quite the expert’s expert, as past Engineering Director of the East Anglian Aviation Society and professional aviation writer and publisher since 1987. 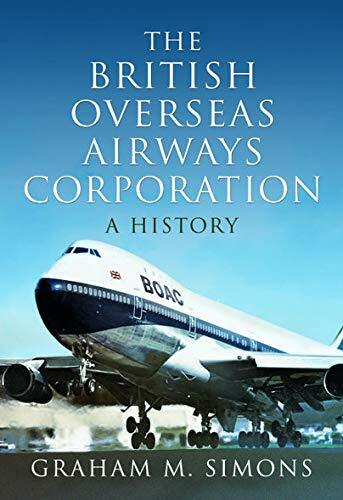 He was also official historian of UK airline Dan Air Services and still is the custodian of its corporate history so airline operations are something he understands. And he is also a Brit . . . and to non-British ears, this book of his in particular is a bit strident in its relentless jibes (many of which probably lost on ignorant furriners anyway) against the role of the state in industry. It is undeniably true that the British have a dismal history in this regard but what we’re saying here is that the book isn’t help by polemic. By an Act of Parliament (1971) BOAC became the national airline in 1974, not just the “official” airline but a nationalized, i.e. state-owned company. Therein (meaning bureaucrats running the show rather than aviation pros) lies, Simons says, the root of everything that went wrong, from aircraft inventory to labor relations to route planning and revenue allocation. And the one time industry absolutely needed the strong arm of government intervention—to secure in advance overflight rights for Concorde—it failed. 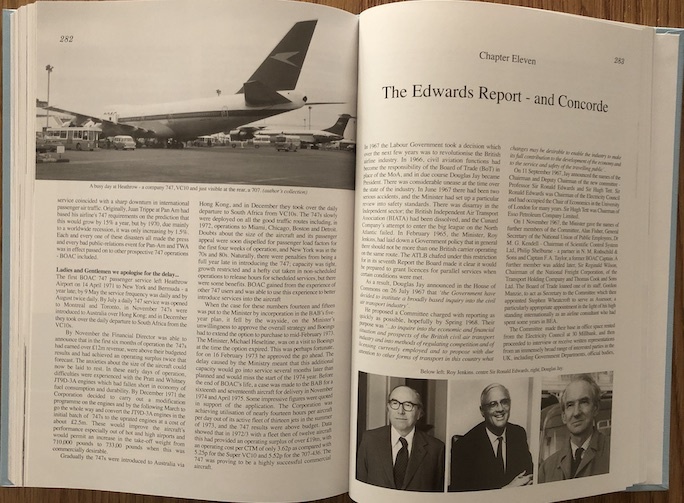 So, this is a big story of the big picture, with many facets, many people, lovely aircraft with lovely names (something BOAC always prided itself on), a thousand decisions big and small. It is an easy book to read front to back but even with a pretty decent index not such an easy book to work with later when you want to find again something specific. 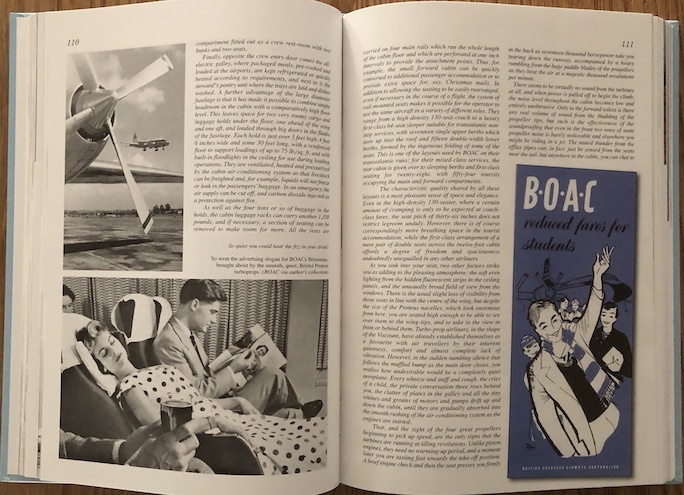 Simons picks up the story with BOAC’s forerunners, Imperial Airways and British Airways, separate companies that merged and themselves were composed of other airlines they had absorbed. The running of an international airline brings together a multitude of themes and the reader will have much to chew on. 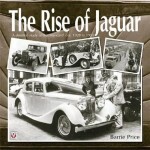 The story advances chronologically and plays out against the backdrop of domestic and international politics and economic dynamics, specifically in relation to the aftermath of WWII and the dearth of raw materials in Britain necessitating the use of war surplus, outdated aircraft many of which of American make. BOAC had interests in other countries’ national carriers, such as QANTAS and this too is discussed. In later chapters the focus shifts to specific aircraft—the beloved but unsuccessful VC10, the short-lived Comet, the unsustainable Concorde, and the 707 and 747 workhorses. 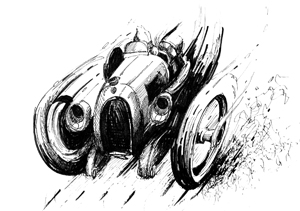 The book is very comprehensively illustrated and here especially one wishes it could have been larger. 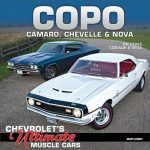 Photos of aircraft, in-house publications, brochures, travel posters and more paint a rich picture. 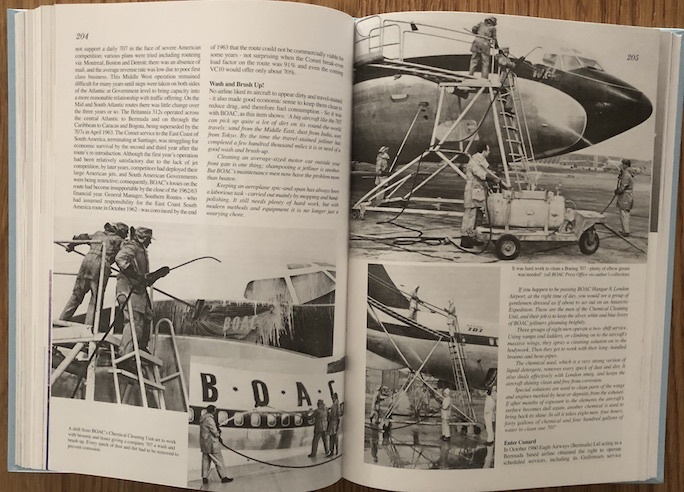 Appended are all sorts of useful data, from BOAC chairmen and board members to British PMs and Civil Aviation Ministers; and aircraft classes, names, and call signs; and that all-important list of abbreviations used and a bibliography too. 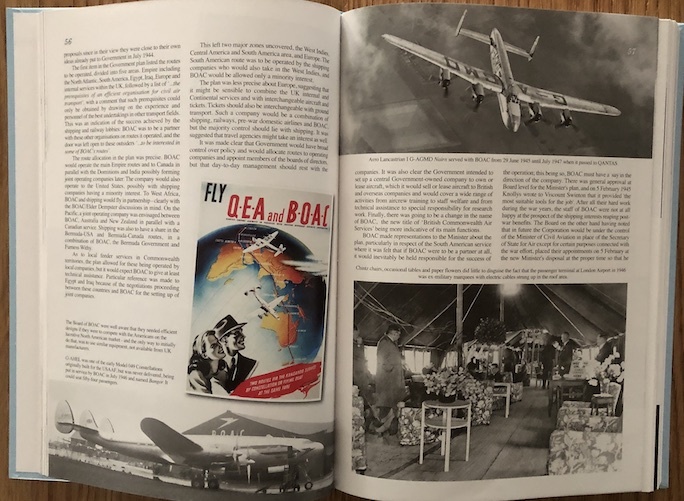 The transition from war- to peacetime, and the resulting new world order are important topics so even aside from its airline theme this book covers important ground. Airlines seem to be on Simons’ brain these days—his next book will be on Olympic Airways. Posted Under: Aviation, Civilian | Author: Sabu Advani	| Comments not open.